The findings on eye examination are consistent with Roth spots. 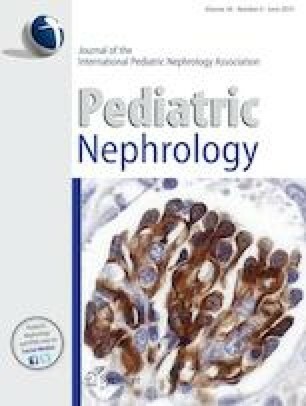 In view of her background of congenital cardiac disease with the presence of an indwelling cardiac conduit, the most likely diagnosis is bacterial infective endocarditis with secondary immunologic sequelae including glomerulonephritis. The next step in evaluation and management is taking repeated sets of blood cultures and commencing empirical antibiotic treatment. In our patient, three repeated sets of blood cultures were positive for Leptotrichia goodfellowii, a rare, slow-growing anaerobe. Antibiotic treatment was adapted as per sensitivities of the bacteria and she received a total of 6 weeks parenteral antibiotic therapy. This refers to the article that can be found at https://doi.org/10.1007/s00467-019-04242-6.